Research states that the health benefits gained from playing Wii Fit is less than recommended fitness guidelines. 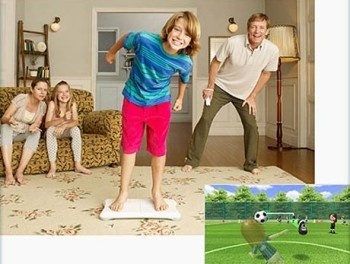 The Wii Fit game, for use with the Wii Balance Board, is intended to be a wonderful workout for the whole family. The game and peripheral sold over 20 million copies worldwide for Nintendo. By all accounts, it was a huge success, but research released by University of Wisconsin La Crosse Exercise and Health Program declared that the exercise in Wii Fit is a "very, very mild workout" and that gamers would be better served playing Wii Sports for any real health benefit. One can understand how standing on a balance board for long periods of time might not exactly be sweat-inducing, but the research used six of the more energetic activities in its experiments: Free Step, Island Run, Free Run, Advanced Step, Super Hula Hoop and Rhythm Boxing. Of those, Island Run and Free Run were the most vigorous and burned the most calories, but even then, neither held significant longterm fitness benefits. With each activity studied, researchers found that performing the actual activity burned much more calories than the virtual one on Wii Fit. You're better off doing Wii Sports than Wii Fit. In Wii Sports there's more jumping around, and you're not constrained by having to stand on the balance pad. I just think there's much more freedom of movement and you get a better workout [with Wii Sports]. I can relate. More than any of my attempts to "play" the boring Wii Fit, playing most of the games in Wii Sports and the new Wii Sports Resort gets my heart pumping faster than a greyhound on speed. No matter how fast you pull the paddle, that damn canoe doesn't seem to go any faster. My poor gamer joints have been sore for days from a vigorous tennis match. And that is something that I can't say in relation to any other game I've ever played. I wonder if Nintendo would have been served had they marketed their suite of games as a fitness regimen, instead of only the Wii Fit series. We don't have electronic personal trainers yet, but at least we're headed in the right direction.